Patient 1 was a 41-year-old man with five siblings . His elder brother was diagnosed as having NA and committed suicide at age 37. There was a consanguineous marriage in his family four generations previously. His initial symptom was clumsiness at age 33. He showed restlessness, discoordination when using chopsticks, and erratic behavior. Slurred speech, unsteady gait and involuntary movements of his extremities gradually became pronounced. At the age of 38, he was diagnosed as having NA on the basis of his choreoballistic movements, speech disturbance, ulcers on his lower lip, the presence of acanthocytes in his blood, and his family history. His involuntary movements were characterized by orofacial and lingual dyskinesias, and choreoballistic movements of the neck, trunk and extremities, and were more severe in the proximal than distal parts of his body. He could not remain standing for a long time even with support because of the severe flexion and extension movements of his trunk. The flexion of his knee joints and trunk became more exaggerated when he tried to stand or walk. He could not chew food because of his lingual dyskinesias, and swallowing was impaired. He had many ulcers on his lower lip from self-biting. 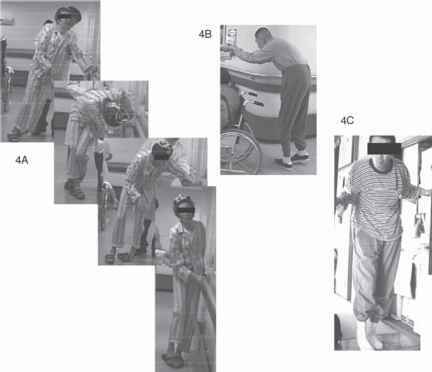 He needed constant assistance by a caregiver in all activities of daily living (ADLs). Tests of cognitive function indicated slight dementia, but he showed no signs of disorientation. He suffered from severe dysarthria and communicated using only simple words. His other clinical symptoms included muscular hypotonia and areflexia of his extremities. Sensory examination showed a slightly impaired vibration sense in his lower limbs. Magnetic resonance imaging (MRI) demonstrated symmetrical atrophy of the caudate nuclei and putamen, with high-intensity signal in the putamen on T2-weighted sequences (Fig. 1). The proportion of acanthocytes in his peripheral blood was less than 1%. HD was excluded by genetic testing. The consanguinity suggested the possibility of autosomal recessive disease, and the prominent orofacial dyskinesias were consistent with ChAc, however MLS was not excluded. Patient 2 was a 37-year-old man. He had two siblings and his elder brother was diagnosed as having NA at 29 years and committed suicide at 33 years. There was no family history of consanguinity. Both parents had acanthocytes in their blood. His father had no clinical symptoms of NA, but his mother showed slight facial grimacing. His initial symptoms were foot dragging when walking and exaggerated gestures at 32 years of age. At age 33, he was diagnosed as having NA because of the presence of acanthocytes in his peripheral blood, chorea, and family history. He gradually developed other symptoms, including writing and speech disturbances, falling while walking, tongue-biting, and abnormal chewing and swallowing. He required complete assistance in his ADLs at age 35. He had slight orofacial, but not lingual, dyskinesias. He showed overextension and flexion of his trunk and neck, and ballistic swinging of his arms and legs, which was more violent proximally than distally. These movements were particularly exaggerated during sitting or standing, and it was difficult for him to remain in either of these positions. He sometimes hit his head against the wall and thus needed to wear a protective helmet. He would perform repetitive non-purposeful movements. For example, he would hold a pillow with both hands, and repeatedly put or pull it under his head. He would repeatedly hit table tops with his hand. This movement pattern was similar to that of ballism or negative myoclonus. His intelligence level was almost normal. His other clinical symptoms were muscle hypotonia and atrophy, hyporeflexia with no pathological reflexes, and a hoarse voice. There was no ataxia or sensory disturbance. MRI showed symmetrical atrophy of the caudate nucleus and putamen (Fig. 2) with high-intensity signals in the putamen on T2-weighted sequences. Figure 3 shows the surface EMG recordings of his choreoballistic movements and the performance of diadochokinesis with his left hand. Genetic analysis showed a heterozygous mutation 4411C > T of VPS13A. The patient's mother was mildly affected and had acanthocytosis, as did his father. Heterozygous mutations have been reported to be associated with ChAc symptoms in a Japanese family with apparent autosomal dominant inheritance  similar to the family of patient 2. However, autosomal recessive inheritance cannot be completely ruled out as a mutation on the second allele cannot be excluded from the methods used. followed by the other side. Surgery was performed on patient 1 in 1995 and on patient 2 in 2001. The surgical procedure differed between the two patients. Patient 1 was operated using the Sugita stereotactic frame without microrecording. The coordinates of the proposed target in the posteroventral part of the GPi as measured by ventriculography were 2 mm anterior to the midpoint of the intercommisural (AC-PC) line (Y), 4.8 mm inferior to the AC-PC line (Z) in the lateral view and 21 mm lateral to the midline of the third ventricle (X) in the AP view. The angle of the lesioning radiofrequency electrode was 60° to the AC-PC line. The location of the optic tract was confirmed using visual evoked potentials, and three thermal lesions were made starting at 2 mm dorsal to the optic tract, and at intervals of 1.5 mm proceeding dorsally from this. The thermal lesions were made at 70 °C for 50 s.
Patient 2 was operated using the Leksell stereotactic frame. The dorsal surface of the optic tract was identified as the tentative target, being immediately ventral to the GPi, and was determined by MRI. The coordinates of the tentative target were Y:1 mm anterior to the midpoint of the AC-PC line, Z:5 mm inferior to the AC-PC line and X:23 mm lateral to the midline. During the operation, neuronal activity was recorded by microrecording, and the specific location of the target was confirmed by neurophysiological and radiological methods. The distance to the optic tract was determined by recording the neural activity of the optic tract in response to a flashed light. Three thermal lesions made at 70 °C for 50 s using a radiofrequency electrode positioned away from the optic tract at an angle of 70° to the AC-PC line. Patient 1 showed a significant, albeit not completely satisfactory, improvement in his clinical condition after bilateral procedures, with reduction in lingual dyski-nesia and involuntary movements of the trunk. After surgery, he was able to eat and stand with less assistance, although still with difficulty. Self-biting disappeared. The lesions as observed on MRI were very small and were not located in the GPi (Fig. 1). 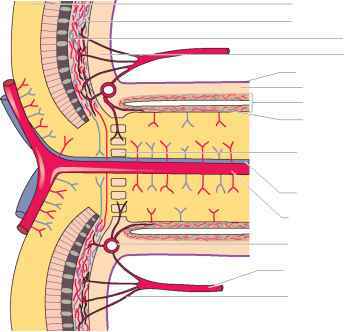 The right lesion involved the optic tract, and the location of the left lesion was unclear. Six months after surgery, he committed suicide. He had not been noted to shows signs of depression. Before committing suicide, he did not complain of any defects or problems in his visual fields. The pathological findings confirmed the diagnosis of NA. The lesion on the right involved the optic tract. until they disappeared completely. He continued to show an anteflexed posture while standing. His ADLs gradually improved until he was able to perform all indoor activities independently. There was no change in his cognitive functions. He had no difficulty in swallowing food or water, but he was bradykinetic. Four years after undergoing bilateral pallidotomy, he was able to sit, walk or stand and maintain these positions easily without any involuntary movements (Fig. 4). Five years after undergoing pallidotomy, he continued to perform his ADLs independently, and exhibited no involuntary movements. On MRI, the left and right lesions in the GPi were located in the ventral part of the pallidum (Fig. 2). 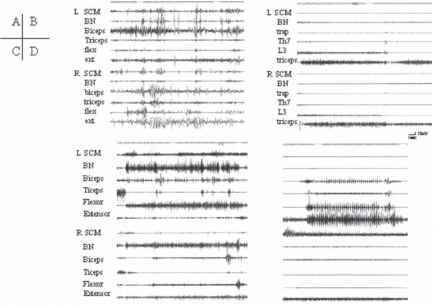 The surface electromyography (EMG) recorded before and after pallidotomy showed a marked effect of the surgery with a decrease in involuntary movements and improved ability to perform voluntary movements (Fig. 3).